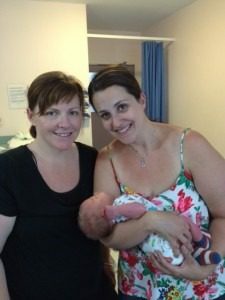 Kylee and Mitchell were taught by Hypnobirthing Australia Practitioner Rebekah Barlow in Esperance, Western Australia. Due to gestational diabetes I was booked in for an induction. Last clinic appointment they did an internal and said my cervix was completely closed and still very long so my husband and I set about softening it all week with nearly every old wives tale we could think of but we weren’t to even imagine that when I went in on Wednesday night (they said come in at 7 but didn’t even get around to examining me until 10) my cervix was very soft, 0.5cm long and… I was 3cm dilated! The midwife said baby’s head was nice and low and i was going to be the easiest ARM ever. But… The dr didn’t want to break my waters until the morning so I was offered a sleeping tablet and sent to bed. Knowing I wouldn’t be able to sleep I took up the offer of a sleeping tablet, Mitchell headed back to his mums for a sleep and I had a shower then slept myself. The suite I was put in was outside the nurses desks and there was a little chatter there to start with which was potentially very distracting. I put on my fear release visualization track on my iPhone and breathed my way through the start of some tightenings. Early in the morning when I visited the toilet I had a bloody mucus discharge which got me all excited for my baby was coming very soon. Thursday 16th jan 2014- aka baby birthing day. I woke up pretty early quite excited and still having tightenings. I didn’t have to wait long until Mitchell turned up at the hospital which was around 6.30am. It turned out he’d had a hard time with felicity early that morning but that meant she was still fast asleep when he left his mums house to come join me so it was sad for her but worked out time wise. We were taken to a bigger birthing suite around 7am as it was hand over time for the staff. I was told that once the dr had done her rounds she would come to me to break my waters. The waiting game was on!! 7.30/8 I asked about breakfast, I was starving and had been asked that many times what my BSL was for the morning and it was 3.8, the lowest I had ever seen it, yet they hadn’t been given anything to eat. 8.30 they finally fed me just before the dr came in. An obstetrics nurse put the canular in after three failed attempts and what I knew would leave my arms all bruised up. Our midwife was very supportive and said she will support us not to use the drip at all if we can avoid it. Examination showed that baby wasn’t in the perfect posi he had been the night before and was now sitting very high, in fact at one point he moved from one side of my belly to the complete other side and the midwife was chasing him on the monitor and asked me if I was sure there wasn’t two in there. Let’s say the midwife wasn’t impressed that the dr couldn’t be bothered breaking waters last night when baby was down and ready to slide out. I was however 4cm dilated now. So anyway, the dr attempted to break the waters unsuccessfully (most painful experience ever and I nearly cried). She then went off and they waited to see if there was any pooling before making a second attempt. 9.30am Second attempt at breaking waters. A different dr came in this time and after examining me had decided to use the finger glove with the scratchy bit on the end to break waters instead of attempting the giant crochet hook like the last one. What a relief! It was just like an extended version of a Pap smear in a way. A huge gush of warm waters flooded onto the bed and kept coming. Because the baby was still very high they had the hormone drip all set to start and the midwives pushed down on my stomach to put bub in the right direction as there was A very high chance of cord prolapse, this was all explained and we questioned the necessity of it and agreed it would be something we would do. I had to sit up for at least five to ten minutes to allow the waters to drain and slowly get bub to descend. I was desperate to lay on my side at this point as tightenings were happening stronger and more frequently by now. I calmly breathed through each tightening and listened to the hypnobirthing track that Mitchell had put on for me. I had him let me know as soon as I was able to lay on my side. It wasn’t long but by the time came I felt the tightenings start to take control Nd I was struggling to maintain my focus. Midwife was in the room I kept allowing myself to come out of the zone to check if she had organized the epi. The rational part of my brain that knew I was talking nonsense was telling me to just ask for Annie to come back but the polite Kylee that doesn’t want to bother anyone didn’t want to interrupt her tea break. It was around now the drip was turned off and in the end I was only given 16mls. Annie was only gone around ten minutes. Once she returned and found out what was happening she talked calmly to me and said how she knew how much I had my heart set on a natural birth so she wanted to just check how I was progressing. I agreed and I remember her saying although she couldn’t check for long as I had a big tightening while she was checking, I was around six centimeters. By this time it was around half an hour/forty five minutes since my waters were released. ine lol this was because Annie had mentioned it before checking me and this is one thing I’ve been completely adamantly against especially so close to bub being pushed out. Mitchell was firm with being my spokesperson as we had planned and said no to that. Just a few pushes later, probably two or three, everyone started getting excited and declaring he was nearly here then one more push and he was out! Total time from when waters were broken at 4cm dilation was 1.5hours. 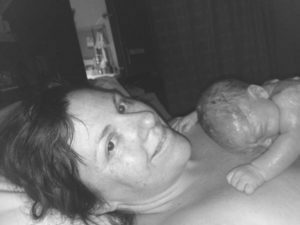 Jonathan was birthed, crying immediately and was put straight on my chest, well lower chest/belly and I leant down a bit to breast feed as they waited for the cord to finish pulsing and then clamped it and Mitchell cut the cord. I got at least an hour and a half skin to skin time and was so thankful for everyone helping me to have the birth I wanted. I asked pretty soon after giving birth if I had pooped as I thought I may have but was reassured that I didn’t poo. Gave Mitchell a high five, two for two with no poo!! I did however have a second degree tear which was sutured up by a doctor that was brought in and the gp who had been in with us, Beth, watched and was taken through the process slowly. Everyone cleared the room pretty quickly once I was sutured up so it was just Annie and us. My lunch arrived and I went and had a shower, very proudly walking to the bathroom by myself with ease which is something I couldn’t do last time due to having an epidural. After getting dressed and coming back in the room, Mitchell was like ‘look at you walking around like nothing’s happened and sitting on a normal chair to eat lunch!’ I was feeling fantastic and was really happy to be able to comfortably walk, shower, dress etc. I was most excited that I didn’t need help getting my underwear and pad on this time. When it came time to be taken upstairs to my room, I honestly could’ve carried the baby and walked there myself but I was wheeled in a wheelchair as per hospital policy. Got to my room and was pleasantly surprised with a private room. High five with Mitchell again, two for two for a private room by going public again. Yahoo!